The National Youth Administration requested permission to erect a building on the WKU campus to be used as a workshop for Warren County activities. 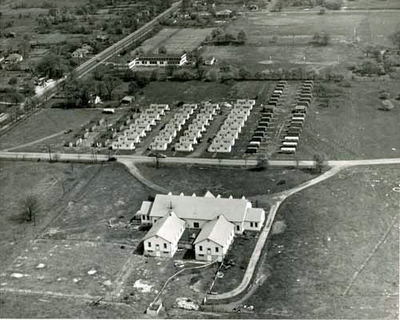 The building which would eventually become the Bowling Green Area Vocational School was built along Russellville Road and behind the tennis courts. It can be seen at the top of the image above in 1946. Also in the photo are seen the baseball fields, Veteran's Village trailers and the Agriculture Pavilion.